This book reviews the latest developments and applications of modeling and simulation techniques in aluminum shape castings, and the need for improvement of these computational techniques. Specifically, topics include design of both the cast aluminum alloy as well as aluminum casting and gating system; modeling, simulation and optimization of both the casting process and heat treatment; modeling and simulation of both casting defect and microstructure; prediction of mechanical performance and influence of subsequent processing on final performance. 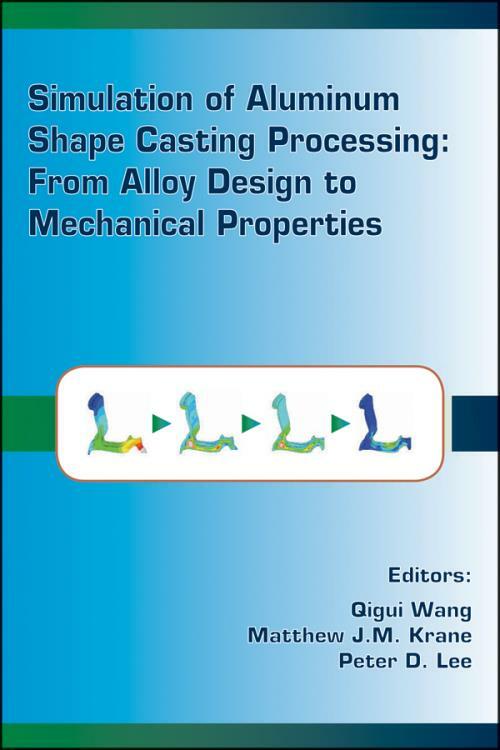 Developers and users of computational techniques applied to aluminum shape castings as well as end users of castings will find this book extremely helpful. Session Chair: Y. Austin Chang. Atomistic and Microstructural Modeling in Aluminum Cast Alloy Applications (Abstract Only Invited) (C.M. Wolverton). Multi–Scale Structural Design and Processing for Increased Strength in Aluminium Alloys (Invited) (B.C. Muddle, J.F. Nie, and C.R. Hutchinson). Advances in Computational Modeling of Microstructure Evolution in Solidification of Aluminum Alloys (Invited) (M.F. Zhu, C.P. Hong, D.M. Stefanescu, and Y.A. Chang). CALPHAD/First–Principles Hybrid Approach: The Study of Phase Equilibria and Solidification Behavior of the Al–Ni–Y System (Abstract Only Invited) (D. Shin, W. Golumbfskie, R. Arroyave, and Z.–K. Liu). Measurement of Thermo–Physical Properties for Solidification of Aluminium Alloys (H. Dong, and H. Atkinson). Modeling of Hydrogen in Aluminum Foundry Melt Treatment Operations (C.J. Simensen, O. Nielsen, J.O. Loland, K. Pettersen, and S. Saelid). Microsegregation Quantification for Model Validation (M. Ganesan, L. Thuinet, D. Dye, and P.D. Lee). Pressure Losses During Pressure Filtration Tests of Liquid Aluminum Alloys (X. Cao). Session Chair: John T. Berry. Virtual Aluminum Castings: The Ford Experiment in Integrated Computational Materials Engineering (Abstract Only Invited) (J.E. Allison). Study on Macro and Micro–Modeling of Solidification Process of Aluminum Shape Casting (Invited) (B. Liu, S. Xiong, and Q. Xu). A Validated Model of the Cyclic Stress State of an A356 Automotive Wheel and Its Impact on Fatigue Life (Invited) (P. Li, D.M. Maijer, T.C. Lindley, and P.D. Lee). Modeling and Simulation of Semisolid Casting (Invited) (G.R. Burgos). Development and Applications of OptCast A Thermal Boundary Condition and Casting Process Optimization Tool (Invited) (M. Li, R. Vijayaraghavan, and J.E. Allison). Novel Solver Strategies for the Computational Modelling of Mould Filling in Very Complex Geometries (M. Cross, T.N. Croft, and D. McBride). A Thermal Model of the Low–Pressure Die–Casting (LPDC) Process and Its Application to Predict Porosity Formation in Aluminum Alloy Wheels (B. Zhang, S.L. Cockcroft, D.M. Maijer, and J.D. Zhu). Quality Control of Squeeze Castings Through Process Simulation (Y. Xia, and J. Bigelow). Casting Defect Simulation and Validation. Session Chairs: Mei Li and David Robert Poirier. The Modeling of Entrainment Defects During Casting (Invited) (J. Campbell). Simulation of Porosity Formation in Aluminum Casting (Invited) (K.D. Carlson, Z. Lin, C. Beckermann, G. Mazurkevich, and M.C. Schneider). Modeling of Porosity Formation in Multicomponent Alloys in the Presence of Several Dissolved Gases and Volatile Solute Elements (Invited) (G. Couturier, and M. Rappaz). A Porosity Simulation for High Pressure Die Casting (Invited) (C.–W. Kim, K. Siersma, and K. Kubo). Computational Analysis of Oxide Inclusions in Aluminum Castings (G. Backer, C.W. Kim, K. Siersma, Q. Wang, and M. Walker). Numerical Understanding of Campbell′s Casting Design Rules (J. Kor, Z. Li, H. Hu, X. Chen, Q. Wang, and W. Yang). Microporosity Modeling in Aluminum Castings (G. Backer, and Q. Wang). Study of Micro–Defects in Aluminum Casting Using X–Ray Computed Tomography (K. Sasaki, H. Badarinarayan, T. Hori, and S. Oho). Modeling of Precipitate Free Zone in Multicomponent Aluminum Alloys (Invited) (Ch.–A. Gandin, and A. Jacot). Modeling the Heat Treatment of Age–Hardenable Cast Aluminum Alloys (Invited) (R.D. Sisson, Jr., S. Ma, and Md. Maniruzzaman). Optimization of Load Arrangement and Thermal Cycle Design for Time and Energy Efficient Heat Treatment Process of Aluminum Castings (Y. Zhou, J. Kang, and Y. Rong). Effect of Various Casting Parameters on Air Gap Formation and Heat Transfer Coefficient at the Metal–Mold Interface (S.A. Argyropoulos, and H.G. Carletti). Numerical Modeling of the Heat Treatment with Residual Heat of Aluminum Castings (H. Liang, J. Kang, and T. Huang). Temperature Measurements for Thermal Contact Calculations in Permanent Molding of Aluminum Alloys (J. Berry, R. Luck, R. Pehlke, A. Johnson, and J. Weathers). Quench Sensitivity of an Al–7wt.%Si–0.6wt.%Mg Alloy: Characterization and Modeling (M. Tiryakio lu, and R.T. Shuey). Session Chair: Paul N. Crepeau. Multistage Fatigue Modeling of Cast A356–T6 and A380–F Aluminum Alloys (Invited) (Y. Xue, C.L. Burton, M.F. Horstemeyer, and D.L. McDowell). Prediction of Fatigue Performance in Cast Aluminum Alloy Components (Invited) (T.C. Lindley, P. Li, D.M. Maijer, and P.D. Lee). Simulation of Tensile Test Bars: Does the Filling Method Matter? (Invited) (J–C. Gebelin, M. Lovis, and M.R. Jolly). Fatigue Life Prediction in Aluminum Shape Castings (Q.G. Wang, and P.E. Jones). Fatigue Mechanism and Life Prediction in Cast Aluminum Alloys A Review (J. Zhou, G. Ran, Y. Wang, and Q. Wang). Modeling of Creep and Bolt–Load Retention Behavior of a Die Casting A380 Aluminum Alloy (C.–C. Chang, and Q. Wang). Mechanical Property Prediction in Magmasoft for 319 Alloy with Copper Content Variations (L. Hinojosa, A. Escudero, C. Esparza, and S. Valtierra). A Brief Review of Multiaxial High Cycle Fatigue (X. Ding, G. He, C. Chen, Z. Zhu, X. Liu, and P. Crepeau).